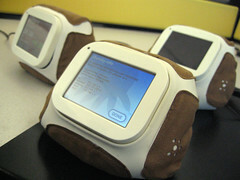 I just got an email from the Chumby people (what is a Chumby, you ask?) regarding my application for a free one. They actually were soliciting free sample requests, accompanied by hacking ideas for them, some time ago. fast and furiously to build more chumbys. Once again, thank your for your continued interest and support. are exciting things in the works at Chumby Industries! I’m guessing someone got one in this round, which was the the first public request round after FOOCamp where they gave many away to attendees. Did you get one this time out, and what did you write you were going to do with it? Personally, having seen Tara’s one since applying for my own, I’m actually not all that impressed with them. They seem quite big for what they are, and rather limited in their functionality opportunities – especially with the size of the screen etc. No Chumby for me either… yet.